Treat your feet & buy yourself a pair today! Do you know how hard it is to take a good picture of your own feet? 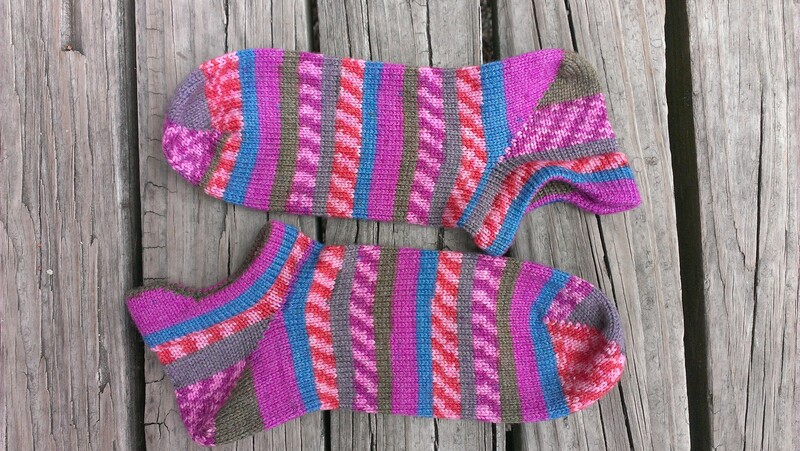 I have gotten better at it over the years since I have always loved handknit socks and enjoyed documenting my creations on Ravelry, Facebook and my blog. Now I am selling my own line of handmade socks. 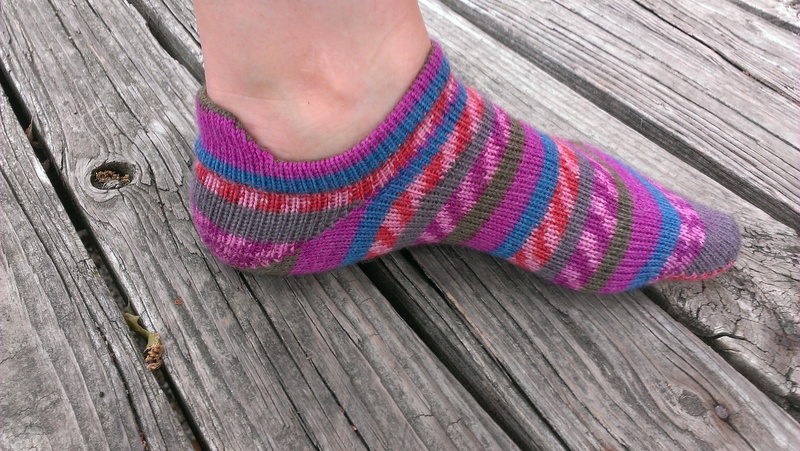 These short Measured Steps socks are fun and funky sport socks of a machine washable and dryable, 50% merino wool, 25% rayon from bamboo and 25% nylon blend yarn. 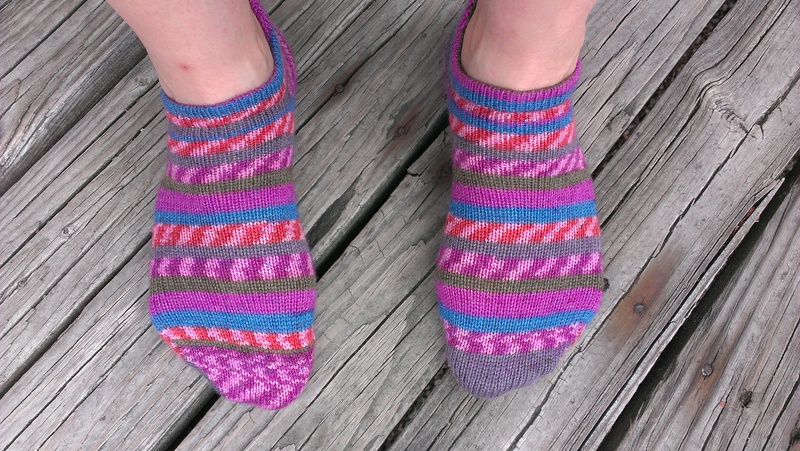 They are soft and comfortable and handmade on my circular sock knitting machine. You. can read more about that here. They are made with the ideal yarn for summer socks, wool for moisture control and softness, bamboo for coolness, and nylon for durability. 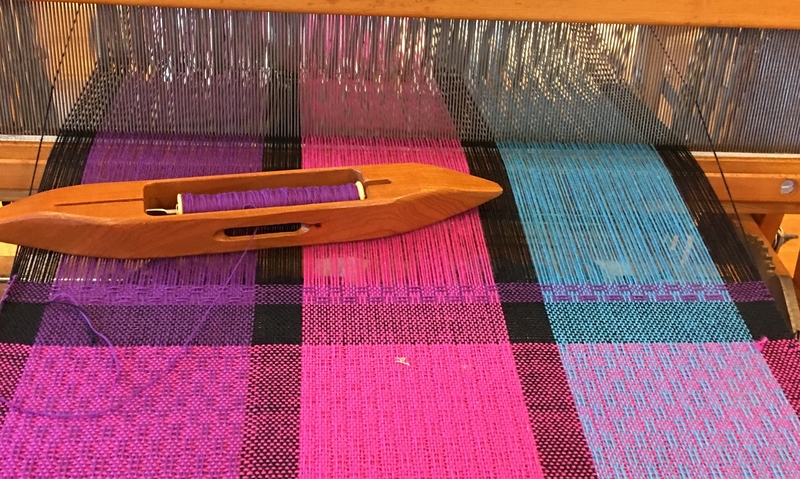 Because I got the yarn at a good price, I am just getting started in the business and want you all to know the joy of handmade socks, I am currently taking orders for women’s sizes 6-9 and offering them for a special introductory price of $14 a pair to my readers and friends (paid in cash and picked up). If you want them mailed to you, it will be an extra $2 to cover Paypal fees and postage. There is a limit of one pair per person at this special price and you must order by Friday, May 22. If you are local, use the “contact” form in the right sidebar (or below if you are on mobile) to let me know. If you are out of town, please place your order through my store. In either case, I will contact you for color and sizing details and let you know how long it will be before I can get them made. The colors available right now are below. Your computer screen may render the colors slightly different than the actual color, but they are very close on my screen. Yarn #s 1 & 2 on the right will produce a “Fairisle” look like the pair above. 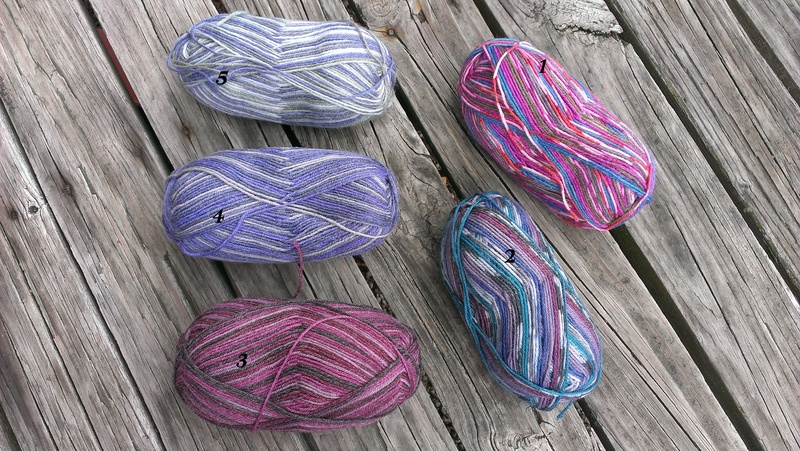 The yarns on the left (#s 3,4 & 5) will produce a striped pattern similar to this. Again, send me a note using the contact form to order or use my store if you are out of town.